CHERRY pickers have been brought in to clear dangerous branches at Lake Borumba left broken and dangling in the aftermath of the fierce storm that battered South East Queensland on Sunday evening. 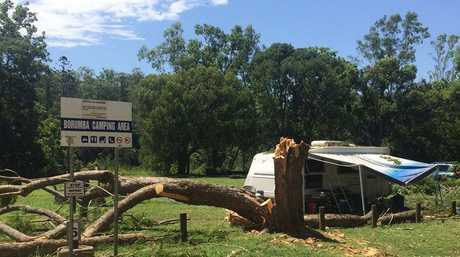 The recreation areas surrounding Lake Borumba are temporarily closed after an angry storm ripped through the region, causing havoc on the water and to nearby campers when a large tree smashed onto their caravan. 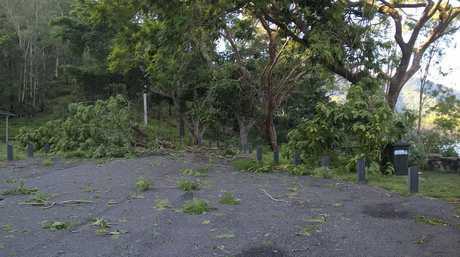 Seqwater's Murray Dunstan said they had paired up with the Gympie council and SES to clear the area, where high winds brought down trees, branches and powerlines, leaving behind a mess of debris. "In some instances, there are broken tree branches, at least 300mm in diameter hanging from trees 30 feet in the air, so cherry pickers are being brought in to remove those," Mr Dunstan said. Seqwater crews have been working hard to clean-up and restore power. He said the access road to the recreational area was closed as safety became the priority. "While our aim is to reopen this area in time for the weekend, the priority is making sure it's safe." 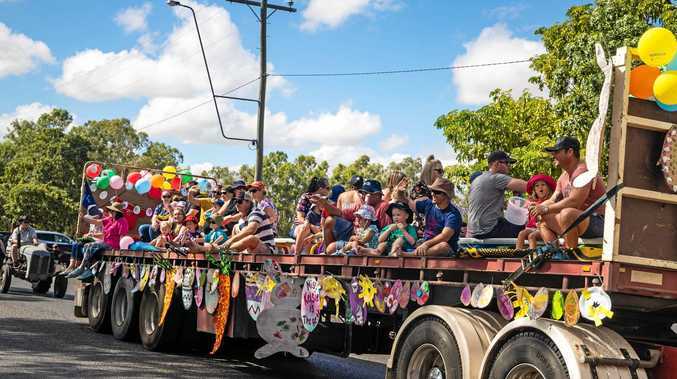 "Unfortunately the storm on Sunday ripped down hundreds of powerlines across Queensland and was followed by more storms this week, so we've had to be patient for energy crews to restore power to the area," Mr Dunstan said. Power had been partially restored as of today but the area was not likely to be opened until the weekend, Mr Dunstan said. The storm has not significantly impacted construction works for the refurbishment of the Borumba Dam Camp Ground. The project, which began at the end of January, includes construction of a new site office as well as a complete upgrade of the existing shower and toilet facilities. Camper van crushed by Mary Valley storm: A couple have a had a lucky escape when their camper van was crushed by a tree in this week's severe storms. UPDATE: Two campers at Borumba Dam came within inches of sudden death in Sunday night's storm when a giant gum tree near their parked caravan was struck by lightning. The tree split in half and crashed down on the couple's camper van while travellers Ken and Marj Ritchie were inside "thinking of a roast dinner". Marj had been standing in the spot where the tree crashed through seconds before. Mr Ritchie said they were very frightened during the ordeal. "I was on the computer and Marj was doing a bit of reading, and at about 5pm the storm came down through the valley," he said. "There were massive winds, then we heard this almighty crack and next thing you know we've got no awning, and half the foliage from the Borumba Dam sitting on top of the caravan. "We didn't know really what was happening, when you look outside and all you can see is trees it's a bit disconcerting." MORE than 113,000 lightning strikes hit the region from Gympie to Caboolture in last night's damaging electrical storm, Energex has confirmed. The spectacular hit rate was more than twice as many that usually occur in storms in the area, Energex spokesman Danny Donald said. Of those 113,600 strikes, 20, 000 hit the ground, while 93,000 were from cloud to cloud. He said 40,000 strikes is the norm for storms in the region between Brisbane and Gympie north, of which about 6000 to 8000 tend to hit the ground. The strikes took their toll on the region's powerlines, with homes in the Mary Valley still out of power on Monday afternoon, including 35 at Imbil, 11 at Bollier, 25 at Bella Creek, and seven at lake Borumba. Mr Donald said the damage to the network was immense, despite the safety surge protection, and Energex officers had been working around the clock today. Last night power was restored to 32 Gympie homes, 1005 Cooroy homes and 5521 Kenilworth homes. 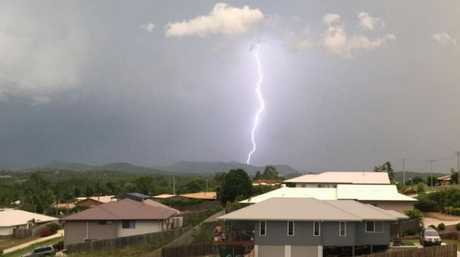 South East Queensland received a total of 265,000 lightning strikes in the same storm. Borumba storm : A fierce storm ripped through Borumba Dam late Sunday evening, turning the calm water to a choppy mess. A STORM that ripped through Borumba Dam last night was close to causing disaster when a boat got pushed dangerously close to the dam wall. Terry and Bernadette Smith, who arrived at the dam for a late afternoon jetski, became part of a small rescue operation when the storm hit at 5.30pm. Within a few minutes of pulling into the boat ramp car park a ferocious and intense 'mini tornado' whipped up waves on the large in-land dam and played havoc with two boats on the water. Torrential rain with small hail was dumping and the wind was violently rocking their Nissan Patrol, but the Kandanga couple knew they needed to get on the water to where one boat was entangled on the float barrier before the wall. "I honestly thought it was going to end up on the wall of the dam - the wind was blowing that hard," Mr Smith said. Mr Smith reached the boat on jetski, where two people (and a small dog wrapped in a blanket) had managed to unhook themselves from the float but with their engines gone, were using oars to fight the almost three-quarter metre-high waves. By the time Mr Smith had towed the boat to shore it was filled with water, Mrs Smith said. When the heavy rain and wind lifted and both boats were safely ashore, the dam's visitors couldn't believe the destruction the intense storm had caused. "I was just in disbelief at the number of trees totally ripped out and totally smashed," Mrs Smith said. "It was like someone got a chainsaw and split them down the middle." Large well-established trees, including mature jacarandas were destroyed, making the three-minute trip around the side of the dam to return home an hour long as the vehicles stopped to cut and remove fallen trees.